Q: When will my electric fireplace arrive? 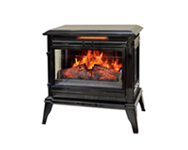 A: Your new electric fireplace will ship within 2-7 days of your order. Transit times vary depending on location, but you should expect delivery within 5-12 days of your order. Please see Shipping Information for more details. A: Absolutely. ElectricFireplacesCanada.ca maintains the highest level of transaction security and is certified for SSL encryption. You can be certain that your payment information stays private and confidential. Our Satisfaction Guarantee enables you to feel comfortable with your purchase. We stand by our products and will make every effort to make your buying experience a positive one. We do not sell or release any customer information. 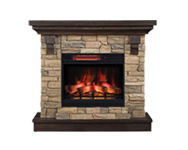 ElectricFireplacesCanada.ca is an Authorized Internet Distributor for Dimplex and Classic Flame products. We have a direct purchasing relationship with these manufacturers and maintain stock of each product line. All manufacturer warranty and service obligations are in effect. Because of our direct relationship, we will even assist you with communication with each company, should the need arise. 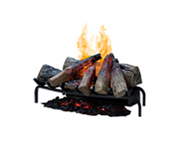 Q: How does the fireplace come when it is shipped to my home? A: Electric fireplace mantel packages will typically arrive in two boxes. One will contain the mantel and the other will contain the electric firebox. 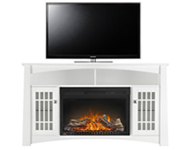 Electric Fireplace Log Inserts, Free Standing Electric Stoves, Wall Mount Electric Fireplaces, Built-In Electric Fireplace Boxes, Plug-In Electric Fireplace Boxes and the smallest Electric Fireplace Mantel Packages are shipped in one carton. A: Yes, the majority of our electric fireplaces are ready to plug into any standard 120V household outlet. Our Built-In Electric Fireplaces require hard-wire installation (although plug kits are available) and are “dual” voltage, which means that they can be wired for 120V or 220V power (this doubles heat output). Installation is quick and inexpensive. A: Our electric fireplaces can function as supplemental heat source for rooms 15'-20' (400 square feet). Built-in electric fireboxes can be wired to 220V power, which doubles heat output. Q: Are electric fireplaces cost efficient? A: Yes, electric is on average much cheaper than other forms of heating your home. On average electricity rates are $.02/hour without heat and $.07/hour with heat. Electricity rates vary depending on location. Electric fireplaces are a terrific option for zone heating. For comparison; gas fireplace manufacturers regularly advertise running costs of $.23/hour. Q: Is it safe to move the fireplace to another location once it is assembled? A: Yes, the fireplace, once assembled, is sturdy and is safe to move. Q: How many watts/BTU’s does it give off any hour? A: No, however all of our fireplaces have the functionality to operate with the heat on or off. A: Most of our electric fireplace’s come with a remote. The remote will allow you to turn the fireplace on or off, adjust the intensity of flame, and adjust the level of heat that the electric firebox will give off. Typically, there is also a covered control panel on the front of the unit that can be activated manually. 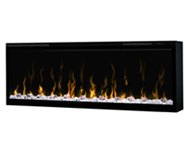 Q: What are your electric fireplace mantels made out of? A: They are made from solid wood and the highest quality furniture grade real wood veneers. Q: What is the difference between the Built-In “Builders” Box and the Plug-In Firebox? A: Both the Dimplex and Classic Flame Built-In Electric Fireboxes are designed to be installed and hard wired into a buildings electrical system (although plug kits are available). These units support either a 120-volt service or a 220/240 volt service. The 220V service produces higher heat output (9600 BTUs) than the 120V option (4600 BTU’s). This is different from our Plug-In electric inserts/fireboxes which are made to go directly into our corresponding mantels. They cannot be wired directly; instead they simply plug into any standard 120 volt household outlet. A: No, our fireplaces are all vent free and therefore there is no need for any chimney, any venting, any gas lines. There is no open flame, no mess or clean up. Q: Do your fireplaces give off any fumes or gases? A: No, our fireplaces do not emit any fumes, any CO2, any smoke, any emissions, nor any pollutants. Q: Does the glass front get hot? A: No the glass front always remains cool and is perfectly safe. A: The only maintenance required would be to change the standard 40 watt candelabra light bulba, which have a standard life of 2 years, if it burns out. These bulbs can be readily found at home centers. Q: Can I buy just the electric firebox? A: Yes, you may buy the same electric fireboxes found in our mantel packages. 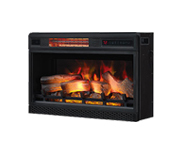 These fireboxes are found in our Plug-In Electric Fireplace category.